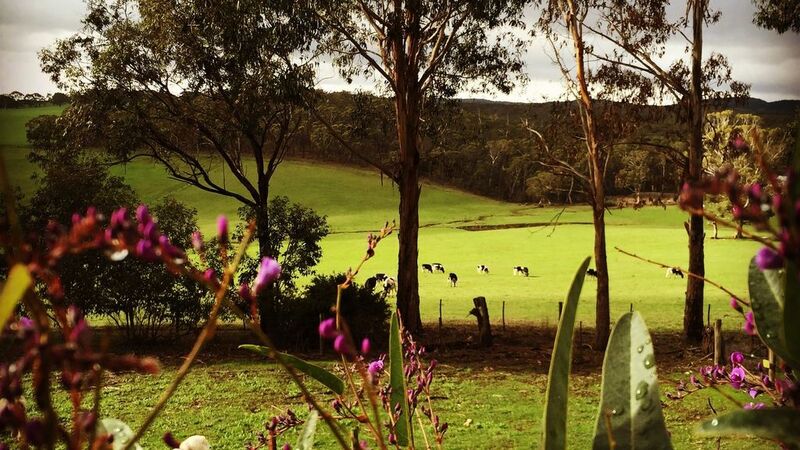 The Pennyroyal Valley is a world apart from the bustling resort town of Lorne and the Great Ocean Road, yet within easy reach of all the coast has to offer. Pennyroyal Farm boasts several fully self-contained, purpose-built holiday cottages. Most feature soaring timber ceilings and unusual wavy-edged cypress timber cladding and kitchen benches. Why Are Our Cottages Unique? * All feature a fully fenced native garden to ensure your privacy and security for pets. * Enjoy the privacy: extensive native gardens surround the cottages with abundant bird life. * Choose from three different cottage designs, see cottage descriptions for details. * Relax on the sundecks with outdoor furniture and gas BBQ. * Wood-burning heaters with ample firewood supplied. * Reverse cycle air conditioners and ceiling fans. * Linen, towels, guest soaps and shampoo supplied. * Candles and bath salts supplied. What Makes the Pennyroyal Area Special? *Every cottage is well fenced for pet security. * Pet-friendly walks from your door. * Pets welcome inside (see our pets welcome policy). * Minimal environmental impact: we use timber grown and milled on the property and quality recycled timber. * We grow and harvest our own firewood. * We've planted around 20,000 trees to ensure future building timber supplies and firewood. * "Very much enjoyed a relaxing weekend away. Very peaceful and great views. It's fantastic that the cottage is all enclosed which has allowed our dog to run around the boundary and us know she can't get out. Thanks for a great weekend." * "Your attention to detail is what makes our stay here so special and made us want to come back —Thank you. Our dog was impressed too." * "Excellent standard. Extremely comfortable and spacious. Most amazing bed I've ever slept on. Everything beautiful and clean in the cottage and very cosy. Especially loved the size of the grounds and fencing. Very secluded and peaceful." Had a great 2 night stay. Spa on the deck was amazing. Plenty of room for the dogs to run around and being fenced, we were able to leave them outside to wander and explore without having to watch them the whole time which gave us time to relax. Nice and private. My second time staying here. Will be back again. Thank you so much for your kind words! We are so pleased that you pleased that you had a relaxing stay and that your pooches were able to be free. We would love to see you again some time soon! Acacia cottage has a lovely, mainly native garden, and big windows & verandah to enjoy the wonderful valley views. But the standard was let down by water-damaged ceilings, especially in the ensuite bathroom, (no fan) where there was mould. The fridge door seal was falling off, and water was puddling on the floor. The range hood needs cleaning. The corrugated gravel road from town needs grading for easier access. Well kitted out, wood fire made for some cosy nights. We had a wonderful stay at Pennyroyal farm, the cottage was beautiful and very comfortable, the scenery was breathtaking.